Changes in the direction of decentralisation added significant adjustments to the budget formation and funding of the life of towns and amalgamated hromadas. Small towns and amalgamated hromadas with over 50 percent of the country’s population, are real indicators of the situation in the state. In Ukraine, towns with a population of less than 50 thousand people make up about 2/3 of the total amount. Small towns around the world preserve the cultural heritage and national identities. 2018 was declared the Year of Cultural Heritage in the European Union. Ukraine did not stay away from processes. 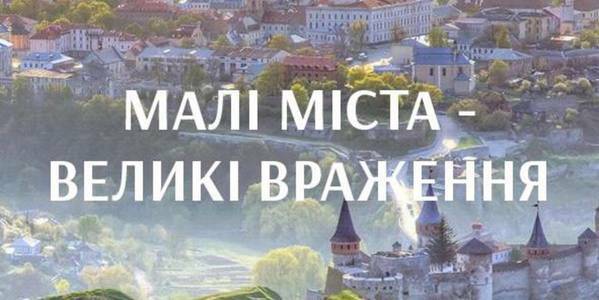 In 2017, the project “Small Towns – Great Impressions” was initiated, promoting further cultural and economic development of the territories. The Ministry of Culture of Ukraine, in particular the Ukrainian Centre for Cultural Research, were identified as the main coordinators of the project “Small Towns – Great Impressions”, supported by Prime Minister of Ukraine Volodymyr Groysman. Development of an exclusive idea. Development of a start-up concept. Marketing support of the project. Prime Minister of Ukraine Volodymyr Groysman: Creation of the conditions for cultural and economic development with the purpose of transforming small towns into self-sufficient ones, development of administrative units by increasing the capacity of their own cultural resource are among the actual opportunities for the decentralisation reform. The contest demonstrated a strong desire for the leadership of small towns and AHs to develop the economy of the territories with the help of cultural innovations. We must provide methodological support and foster the implementation of projects that should become a vivid example of the development of the cultural economy of the territories and present our culture to the whole world, attracting tourists to visit the country and its bright events.